The California Teacher of English Learners (CTEL) exam was designed by the California Commission on Teacher Credentialing (CCTC), in conjunction with the Pearson Evaluation Systems Group and the English Learner Instruction Design Team (ELIDT). The CTEL was designed with specific knowledge, skills, and abilities (KSAs) in mind, and implemented with the goal of assessing English language educators’ comprehension of those specific KSAs. The ultimate aim of the CTEL is to ensure California students are working with English language educators who adhere to the State’s stringent educational standards designed to provide a high quality education for every student. What are the eligibility requirements to take the CTEL exam? Prepare with our CTEL Study Guide and Practice Questions. Print or eBook. Guaranteed to raise your score. Get started today! Candidates who sit for the CTEL are those who meet the teacher credentialing standards set forth by the California Commission on Teacher Credentialing (CCTC). For the CTEL, the purpose of the exam is certification, so those who take the exam are seeking certification. This generally means you will have completed a bachelor’s degree and a teacher preparation education program. However, some candidates may take the exam prior to completing their education, so make sure to check with your baccalaureate or teacher preparation education program, as well as the CCTC website, to ensure you meet all testing criteria. What fees are associated with the CTEL exam? There is no fee to change your registration; however, if you wish to cancel your test but fail submit a withdrawal request, or if you do not show up to your scheduled test, you will not receive a refund or credit voucher of any kind. What is the passing score for the CTEL exam? The minimum passing score for the CTEL is 220 per subtest. Each test is scored separately, which means you need to achieve at least a 220 on all three CTEL tests. To pass the entirety of the CTEL, you must pass each subtest. What does the CTEL exam cover? CTEL Flashcards. Proven CTEL test flashcards raise your score on the CTEL test. Guaranteed. The CTEL is a computer-delivered exam consisting of three subtests in the areas of Language and Language Development (CTEL 1, test code 031), Assessment and Instruction (CTEL 2, 032), and Culture and Inclusion (CTEL 3, 033). The content of the subtests reflects an alignment with the aforementioned KSAs, which include language structure and use, additive-language development, assessment of English language learners, content instruction and development of English literacy, methodology for English language instruction, and cultural diversity and inclusion. The most effective way to ensure you pass the CTEL exam on your first attempt is to prepare using the most thorough, reliable test preparation materials you can find. 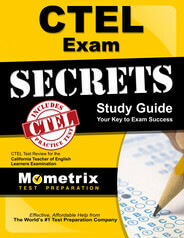 Mometrix Test Preparation’s CTEL Exam Secrets study guide includes everything you need for exam day success. The CTEL Exam Secrets study guide contains actual CTEL exam content, as well as Mometrix’s expert tips for reducing test-day anxiety, improving information recall, and boosting overall test performance. 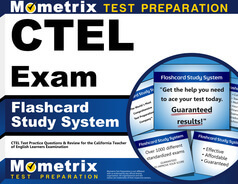 In addition to the CTEL Exam Secrets study guide, Mometrix has developed a complete CTEL Practice Test, along with a comprehensive set of CTEL Exam Flashcards. Pass the California Teacher of English Language (CTEL) exam on your first attempt by reviewing the CTEL Exam Secrets study guide, evaluating your knowledge, skills, and abilities (KSAs) with the CTEL Practice Test, and improving your information recall with the CTEL Exam Flashcards. California’s students await; get started today! Explore our free CTEL review provided by Mometrix. Check out our premium CTEL study guide to take your studying to the next level. If you benefit from these materials, just click the link below! To compliment our CTEL book, we also offer extensive flashcards for even more CTEL exam prep help. We hope you enjoy our products! Your purchase helps us make more great, free CTEL certification content for test-takers just like yourself.